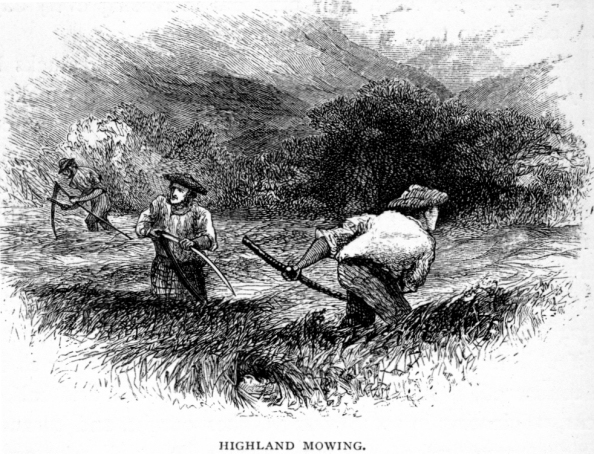 July 1st.—In walking over a field, the grass of which had been cut the day before, but was not yet carried, I disturbed a landrail, who was still sitting on her eggs, notwithstanding the great change that must have come over her abode, which, from being covered with a most luxuriant crop of rye-grass and clover, was now perfectly bare. How the eggs had escaped being broken, either by the scythe or by the tramping of the mower's feet, it is difficult to understand; but there was the poor bird sitting closely on her eggs, as if nothing had happened, and on my near approach she moved quietly away, looking more like a weasel than a bird as she ran crouching with her head nearly touching the ground. In another part of the same field I passed a nest of landrails in which the young ones were on the point of, or rather, in the very act of being hatched, some of the young having just quitted the shell, while others were only half out of their fragile prison. Both old birds were running around the nest while I stooped to look at their little black progeny, and were uttering a low kind of hissing noise, quite unlike their usual harsh croak. The mowers told me that they had seen several nests in the same field, but had avoided breaking the eggs whenever they perceived them in time. Though innumerable landrails arrive here during the first week in May, always coming regularly to their time, the period and manner of their departure are quite a mystery to me. Although in general their young are not hatched till the first and second week in July, they seem to have entirely vanished by the time that the corn is cut: it is very rare indeed to find one when you are beating the fields in September. The partridges here are chiefly hatched about the last week in June. Like the landrail, the hen bird sits very close, and during that time will almost allow herself to be taken up in the hand, especially when near their time of hatching. They seem to be quite confident in the forbearance of my boys, who have an intimate acquaintance with almost every nest in the neighbourhood of the house, the old bird allowing them to peer closely into her nest, and even to move aside the grass and herbage which conceal it, when they want to see if she is on her eggs. A retriever one day caught an old hen partridge on her nest, but let her go again on my rating him, without doing more damage to her than pulling out some feathers. Notwithstanding this she returned to the nest, and hatched the whole of the eggs the next day. Had she not been so near her time of hatching, I do not suppose that she would have returned again. All birds have the same instinctive foreknowledge of the time of hatching being near at hand, and do not, when this is the case, leave their nest so easily as when disturbed at an earlier period of incubation. Some small birds are much tamer in this respect than others. A bullfinch will often allow herself to be taken off her nest, and replaced again without showing the least symptom of fear. Indeed, this bird, if put into a cage with her nest of young ones, will continue to feed them as readily as if her habitation was still in its original situation. Blackbirds, also, are very unwilling to fly off from their eggs. The common wren, on the contrary, immediately forsakes her nest if it is at all handled and examined before she has laid her eggs. She will abandon it if she merely observes people looking too closely at it; but when she has commenced to sit I have known her to be caught on her nest, and replaced, and still not forsake it. A small blue-headed tomtit formed her nest this year in a chink of my garden wall, and allowed the children to take out an egg to examine it from underneath her, without leaving the nest. In fact, instead of being frightened at the intrusion of their hands into her little warm, well-feathered domicile, she picked courageously at their fingers, hissing, and spluttering at them, and never seeming inclined to fly off. When the young ones were hatched, the activity and perseverance of the old birds in providing them with caterpillars and blue-bottle flies were perfectly wonderful. They appeared to fly backwards and forwards to their young family every minute of the day, always bringing some insect in their bills. The good done by these little birds in destroying grubs and flies ought to earn them an immunity from all danger from trap or gun. Gardeners are always too much inclined to wage war against all small birds, forgetting that they invariably feed their young, not with seeds, but with different kinds of grubs and caterpillars, in this way amply repaying any little mischief they may do to the early-sown seeds. For my own part, I never trust a gun in my gardener's hands, but let the blackbirds and thrushes take as many cherries as they like, in return for which they destroy thousands of grey snails, etc., besides giving me many a moment of pleasure by their song. I admit that I do occasionally shoot the crows and jackdaws when they destroy too many of the cherries, particularly as these active marauders come from some distance in large flocks as soon as the fruit becomes red on the trees. I invariably observe that at this season one or two jackdaws arrive first, flying round and round at a great height above the garden. After some chattering between themselves they fly away, returning some hours afterwards with the rest of their family, four or five in number; and if not checked by a few charges of shot, these first intruders soon invite every jackdaw in the country to the feast, their numbers increasing every day, till I am obliged to take active steps against them. About the second week in July the young wild ducks begin to fly. Those hatched high up in the country usually make their way down to the sea-side in that month. They follow the course of some stream or river till they arrive at their destination. Like the fable of the ostrich hiding her head when pursued, the young wild ducks when chased on the river will frequently dip their heads under the water, and keeping it there till they are nearly drowned, fancy themselves secure, although their whole body is exposed. If taken up, and put into some enclosed yard or garden, they will soon become tolerably tame, and get very fat if well fed. The whole of my poultry-yard (as far as ducks are concerned) is supplied by a breed of half wild and half tame ducks, originating in some young drakes caught, and turned out with the tame ducks — the tame drakes being all sent away, in order to ensure the proper cross in the breed. 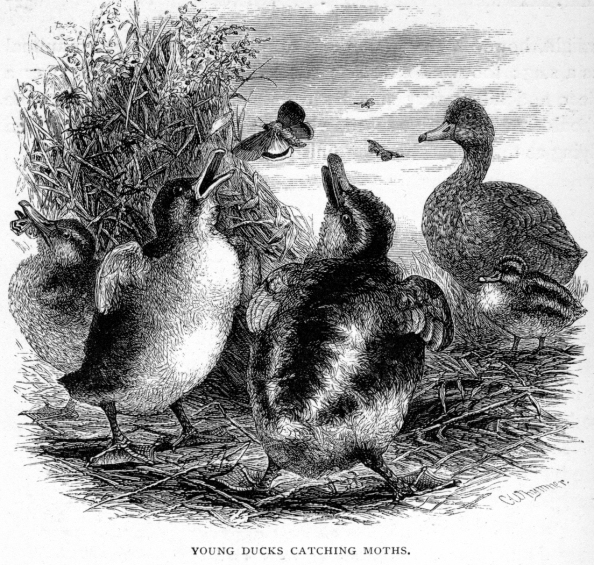 The birds are very much improved for the table by this cross, and are quite as tame as the common domestic duck, only showing their wild parentage in an inclination to hide their nests, and to build at a distance from home — always, however, if allowed so to do, bringing home their broods as soon as they are hatched. At other seasons they never seem inclined to wander, though they are always to be seen at the very earliest dawn of the morning, before it is quite light, spread out over the grass-field adjoining the house, hunting it in a regular line of advance for worms and snails. As the evening comes on, too, it is amusing to see them bent on the same pursuit, and displaying the greatest activity and skill in catching the large evening moths, as these insects rise from the grass or fly low over it.